Photo (by Mom). Shep and I head out across Marie Lake one fine winter day, we would have to travel about 5 miles across Marie Lake, 4 miles through bush and then another 10 miles across Cold Lake before arriving at our destination. Mom was not a happy camper when Dad told her what he needed Shep and me to do. “Mush!” I hollered with all the presnce my eight your old voice could muster. At the same moment I kicked off the toboggan with one foot expecting Shep to hit the traces. Not to be! He just stood there, his feet firmly planted in the snow, refusing to move. The toboggan hit the back of his legs, he yelped and I fell flat on my face into the hard crusted snow. Ouch! Properly chastened, I tried again: “Ok, Shep old buddy, let’s hit it!” This time he hit the harness so quickly I nearly fell off the back of the toboggan. Not a great start, but we were off on our first solo cross country, a trip that mom vigorously opposed. Mom immediately interjected: “Dave! You can’t! 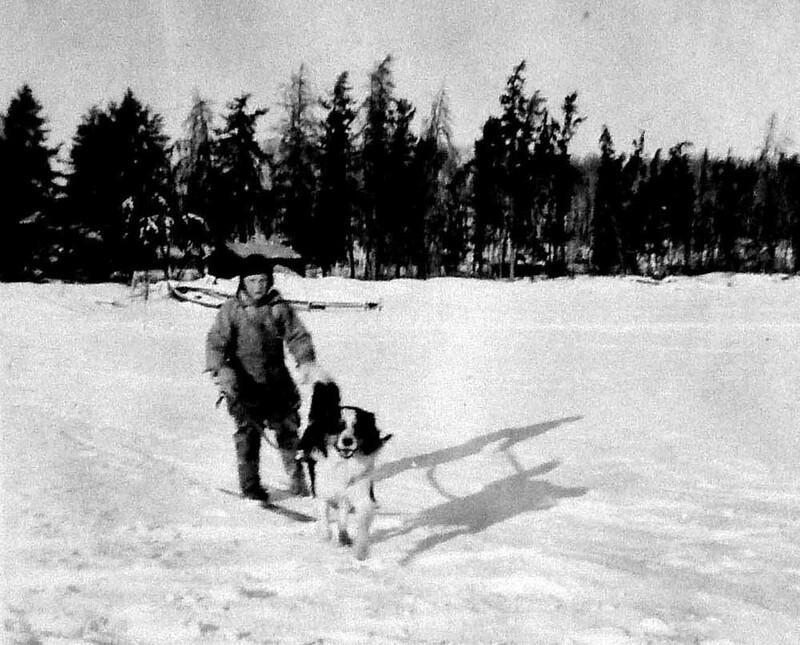 You can’t expect the boy to travel to Cold Lake all by himself.” For Gods sakes man, it’s the middle of winter, its freezing cold and it must be at least thirty miles!” I had not often seen mom so adamant. I quickly interjected: “Don’t worry mom, I can do it! I can do it! Besides, Shep will be with me.” Of course I needn’t have even spoken as mom knew when the jig was up. Dad had already made up his mind that this little trip was going to happen. An hour later, Shep and I were at the edge of the lake ready to go. Mom made sure I had lots of clothes and a big lunch which was wedged under the curl of the toboggan. After the aborted start, Shep and I hit out across Marie Lake. The first leg of our big adventure would take a little over an hour. The weather was clear and cold, about -10F, with a few storm clouds brewing in the southwest. Dad didn’t think the weather would pose any problem but told me if it looked to be getting worse when we arrived at the north shore of Cold Lake, we should follow the ice road that circled the lake so we could stop off at one of the saw mills if needed. 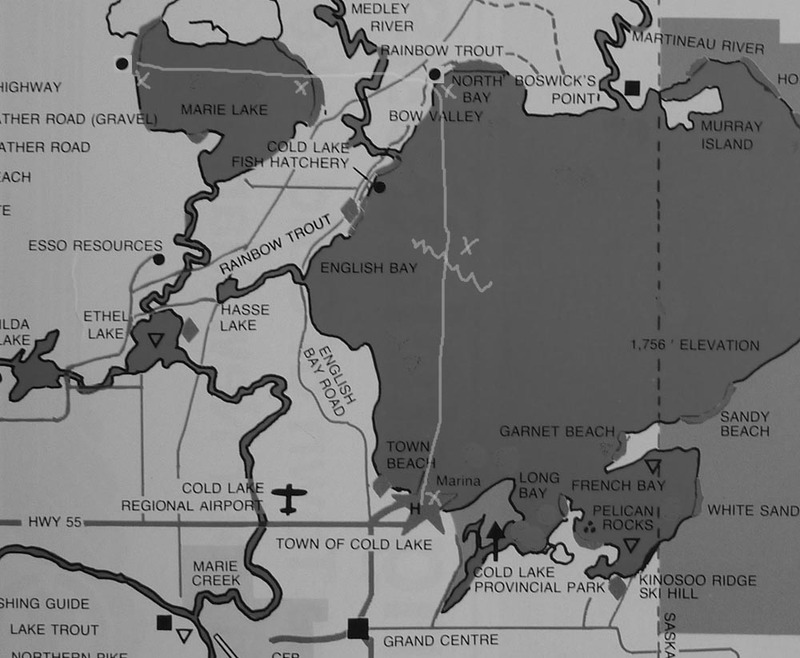 Map: The route travelled east across Marie Lake then overland to the Smith Place, The final leg was due south across Cold Lake. The “X” midway across the lake marks the location of a large ice heave. On Marie Lake snow conditions were excellent for the toboggan. We’d had a warm spell, a week earlier after which it had frozen solid. The crust of snow easily held the two of us even when I walked. The only thing I had to watch was Sheps paws to make sure the pads didn’t get cut. Thawed, then frozen, snow could become as sharp as glass. The past winter when we were skiing mom had made small cloth pads for Sheps feet just in case. I had the pads in my pack. Although I was bouncing with excitement about the adventure went we started, half way across Marie Lake I bean to have second thoughts. I looked back and the house was just a speck in the distance. I suddently felt afraid and we had barely started. What if I got lost? I knew that was not likely as I had traveled this route with dad many times. On the lake you couls see the far shore and in the bush the trail was clearly marked. But what if we ran across a pack of wolves? We had already experienced that when were out on th trapline and I knew it was not something to be overly concerned about. What if the storm caught us? Again, if that happened, I only needed to follow the ice road. No problem. I slowly worked through my fears. We reached the far shore of Marie Lake and headed through the bush towards the Smith Place. The beauty of the snow covered trails and trees is hard to explain. It was very quiet and the snow laden trees looked like a scene on the Christmas cards mom and dad used to sent out each year. About eight miles later we reached the Smith Hill. As we travelled down that long winding hill I remembered the many trips made with dad while hauling logs and at the old home site, everything was now vacant and looked so forlorn. Uncle Warren, Aunt Liz and their family had left the previous fall after having sold the remainder of their mink and fox. They had then lived for a short period on Marie Lake, about four miles from our present home, before heading back to Glaslyn, Saskatchewan for the winter. We didn’t stay long as this place was now so lonesome and even at eight years of age it was easy to think about the way things used to be. The clouds were still hanging deep and dark in the southwest, but it appeared the weather was going to hold until we reached the far side of Cold Lake, so we headed straight across as that would save about two hours. Looking from the Smith Place towards town, we couldn’t see the far shore as white haze that often appears on cold days, covered the distant shoreline. 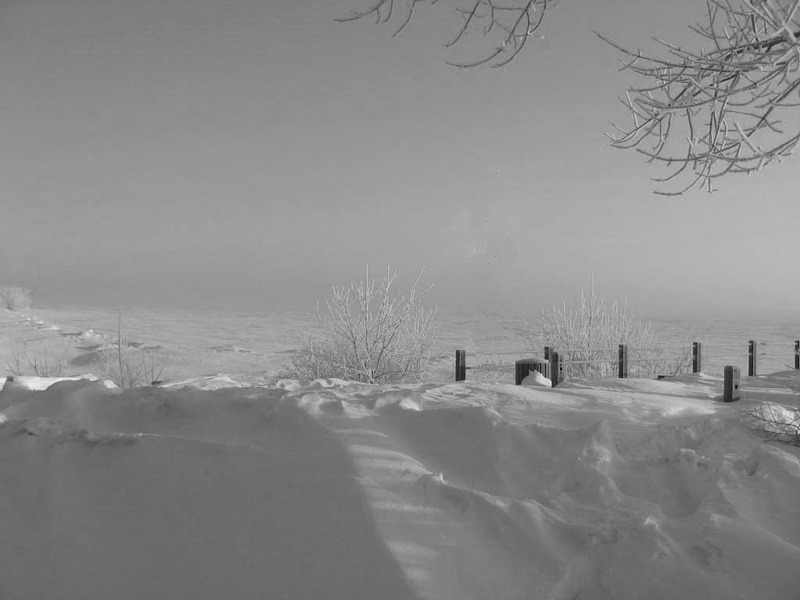 Photo: This 2008 photo from the south-west shore of Cold Lake taken on a sub-zero day, demonstrates how ice fog can quickly lower the visibility on the lake. About half way across, the haze had thickened and we still couldn’t see far shore. When I turned to look back, I was shocked to see the shoreline behind had also disappeared. We were now in the middle of the lake and couldn’t see any shoreline even through the sun was still shining brightly through the haze. I knew that as long as the sun was visible, all I had to do was head in that direction and we would reach the far shore. I was also comforted that Shep could likely get us off the lake without any problem as dogs seemed to possess an uncanny sense of direction. Then a real problem cropped up when we hit a giant heave of ice. It stretched north and south as far as we could see and blocked our path (1). Dad and I had encountered heaves in the past but this was the first time on my own and never one so fresh. It still had a strip of fresh clear ice, several feet wide running parallel to the heave. The clear ice extended both ways as far as I could see, so following the edge until it stopped could add miles to our trip and would certainly keep us on the lake until well after dark, something I really didn’t want. What to do? I was pretty sure the clear ice was thick enough to hold Shep and I but what if it wasn’t? If we broke through we might drown right there or, if we managed to crawl out, we would surely freeze to death before we reached town. We stopped to have lunch while I mulled it over. By the angle of the sun it was approaching two o’clock and, although the skies were clear overhead, the haze on the horizon seemed to be getting thicker. This far north the sun was never up much before 8:30 in the morning and, depending on conditions, it could be dark well before 3:30 pm. We still had a good eight to ten miles to travel so we had no more time to dally. Decision time! Someone, probably dad or Mr. Goodrich, had taught me to check the thickness of the ice by looking at the small cracks. The cracks suggested the ice was about two inches thick, enough to hold Shep and me. However, some of the ice was covered with a layer of snow. When we were fishing, I had watched men fall in the water after stepping on an ice hole that had drifted over. Open water, covered over with drifting snow, might not freeze for several days. Luckily, the crust of the snow was very hard and should hold our weight. I climbed on the toboggan and we scooted across the clear ice. We had to stop on the snow at the heave as Shep couldn’t get over with the toboggan attached. I quickly unhitched him and he jumped over the top while I threw the toboggan over. When I reached the top, I could see open water inside the heave. The heave must have been fairly fresh. On the other side, I kneeled on the toboggan, pushed off and slid to a stop beside Shep. We took only a moment to congratulate ourselves, I attached the harness and we headed out on the last leg of our journey. About three miles on, the far shore came into view and we had only missed the town by a half mile. Once on shore by the main dock, we headed up to the Lakeview Hotel, where Uncle Tonnie rented a room when he wasn’t living in one of the bush camps. I was lucky to catch him in and told him about dad wanting him to come out to pick up some lumber. He asked where dad was and I told him back at Marie Lake, then told him about our trip. For some reason Uncle Tonnie was really angry that dad had sent me all that way on my own. He seemed to have forgotten that from a very early age he had been doing these very same things. We went to the restaurant to say hello to Aunt Irene and, of course, have something to eat, then headed to his truck. We the toboggan loaded, Shep and I jumped in the cab. It was well after dark when we headed out on Cold Lake and almost 9:00 pm by the time we arrived at our home on Marie Lake. I think I must have slept most of the way, dreaming, I suppose of my big adventure. At home, mom was beside herself not knowing if I had arrived safely and was so thankful her little brother had decided to drive back that night rather than waiting until the next morning. As I remember, Uncle Tonnie had a few words with dad about the whole affair. Over the next few days I made several trips with Uncle Tonnie as he hauled the lumber dad had cut over the previous winter. The truck he was now driving was much newer than the old beater he had been driving when he first hauled ties out of the Martineau River area so we never became sick from exhaust fumes. Travelling with Uncle Tonnie was always a lot of fun and they were memorable days. I didn’t know then but we were nearing the end of our time at Marie Lake. Early that spring dad announced that after he had finished cleaning up the final bits of lumber, he was selling his share of the mink ranch and we would be moving on. Before the ice was out of lake that spring, dad and mom had moved most of our belongings to Cold Lake where everything was put in storage. They told us they would be heading out with Aunt Irene to work the summer on road construction in southern Alberta. Louise and I would be going to live with Aunt Liz and Uncle Warren who had now moved to Harland, Saskatchewan, to again take up farming. As you might expect, we took this news very badly as we had become so very close to mom and dad during our time at Marie Lake. We also learned our good friend and constant companion of the past two years, Shep, would be staying behind with Mr. Goodrich. I was devastated. Dad promised he would pick up Shep later that summer when we all joined up again. I knew Mr. Goodrich had also come to love Shep and that he would take good care of him. As for my wagon, it would be put into storage in Cold Lake with the rest of our belongings. While all this bad news was hard to take and had left Louise, Mom and I in tears, there was one further event at Marie Lake that would leave a lasting impression on my young mind. 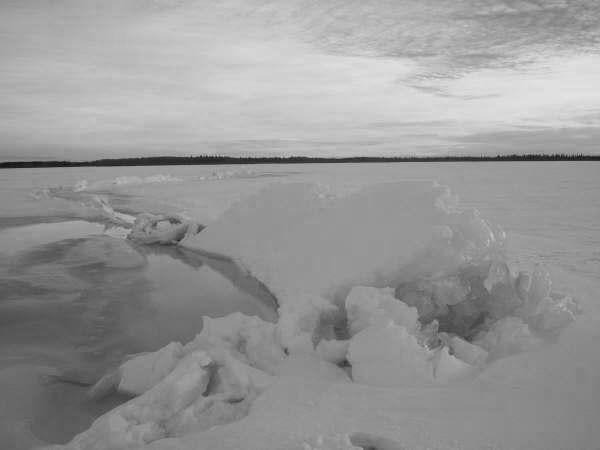 (1) Ice heaves were common in Cold Lake. In the winter as the weather warmed and cooled the ice would expand and contract. Cracks appeared during cold periods when the ice contracted causing it to split apart. During warm periods just the opposite occurred. The pressure from the expansion would suddenly release by forming a heave. While usually small, they could sometimes rise three or four feet. The noise created when a crack or heave formed could be heard for many miles. Both at cracks and heaves, it was not uncommon to find stretches of open water and at heaves both were often present. When a period of warming (that caused the heave) was suddenly followed by a cold snap, the ice could back off leaving an open stretch of water. This is most likely what Shep and I had encountered.